The first charting version was done by Floyd Cramer in 1962. His version fell just short of the U.S. Top 40. In 1963, trumpet player Al Hirt recorded the instrumental, and the track was the first single from his album Honey in the Horn. It was Hirt's first and biggest hit on the US pop charts, reaching number four on the Billboard Hot 100 on March 7, 1964 and spending four weeks at number one on the easy listening chart in early 1964. The song was also featured on his greatest hits album, The Best of Al Hirt. Hirt released a live version on his 1965 album, Live at Carnegie Hall. 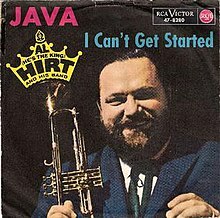 He also recorded the song with Arthur Fiedler and the Boston Pops for the RCA Red Seal album Pops Goes the Trumpet (Holiday for Brass) in 1964. The Muppet Show featured "Java" at the beginning of episode 22, where it was danced to by two creatures. The bigger creature constantly knocked the smaller away. At the end of the song, the small creature blasted the bigger one away. The Muppets performed "Java" on the November 27, 1966 edition of The Ed Sullivan Show. ^ Whitburn, Joel (2004). The Billboard Book of Top 40 Hits: Eighth Edition. Record Research. p. 287. ^ Whitburn, Joel (2002). Top Adult Contemporary: 1961-2001. Record Research. p. 116. ^ "The Best of Al Hirt". AllMusic. Retrieved 2016-08-29. This page was last edited on 11 December 2018, at 06:28 (UTC).